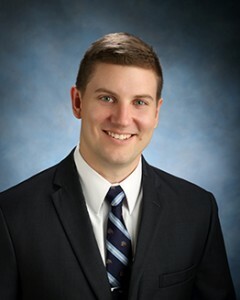 Joshua P. Hunsucker is an associate attorney with Neumiller & Beardslee whose practice areas include community association law, real estate development, business law, and litigation. Mr. Hunsucker joined the firm in 2014 upon graduation with distinction from the University of the Pacific, McGeorge School of Law. While at McGeorge, Mr. Hunsucker served on the Board of Editors of the McGeorge Law Review as the Chief Legislation Editor. Mr. Hunsucker was also a judicial extern for the Honorable Ronald B. Robie and served as the President of the Military Law Society. He is a lifetime member of the Traynor Honor Society. Mr. Hunsucker is a Distinguished Military Graduate from the University of California, Davis, earning a B.A. in Political Science and a B.A. in History in 2005. Prior to attending law school, Mr. Hunsucker served in the U.S. Army as a Ranger qualified Infantry officer in the 1st Infantry Division. He also served in the California National Guard as a law clerk for the Office of the Staff Judge Advocate during law school. Mr. Hunsucker was admitted to practice law in California in 2014. He is also admitted to practice before the U.S. District Court in the Eastern District of California.